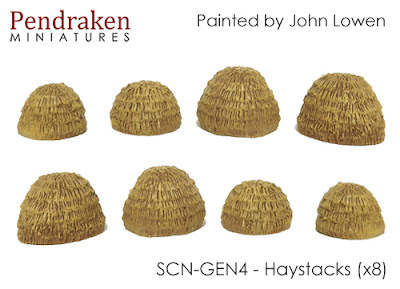 John at Ironclad has been working on some more useful scenic items for us, so we've got some handy artillery markers and also some haystacks. The artillery markers come in two types and are based on 15mm circles. These can be used either as markers for your artillery units or just simply as a bit of extra scenery on the table. The haystacks contain 4 types (2 of each in the pack) and vary from around 15mm wide up to 25mm wide. Both of these releases are on the website £4.00 per pack.